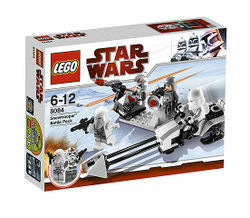 8084 Snowtrooper Battle Pack is a classic Star Wars set released on December 30, 2009. The set includes 74 pieces, and it costs US $10.99, €14.99, £9.99, and AU $22.99, and it is intended for children from the age of 6 through 12. The battle station is made from a 4 x 8 plate. On the battle station is a 360 degree rotating flick-fire missle launcher and a small scanning satellite. On the rotating missle launcher, there is a place for a minifigure to stand. This set is based on events from the Battle of Hoth in the Star Wars Universe, where Imperial forces located, attacked and destroyed the Rebel Alliance's main base. This is a description taken from LEGO.com. Please do not modify it. (visit this item's product page) Defeat the Rebels with Imperial might! Includes battle station, Imperial Speeder Bike, 2 Snowtroopers, AT-AT Driver and Imperial Officer! Battle station armed with rotating flick missile firing gun! Speeder bike measures over 5" (12cm) long! Battle Station measures over 3" (10cm) long! ↑ 1.0 1.1 This set could be found at Toys-R-Us stores in the US beginning in December 2009, one month before the official world-wide release date. Imperial Commander and AT-AT pilot. Rear shot of the aforementioned. Facts about "8084 Snowtrooper Battle Pack"
Defeat the Rebels with Imperial might! This page was last edited on 9 January 2016, at 22:33.